I've always felt right at home in Paris, more than any other European city I've been to. Perhaps it's the similar energy to that of NYC's, or the attention to detail in all the beautiful design and surroundings that I love so much. Parisians manage to achieve multiple juxtapositions at once when it comes to design: they're super classic with neutrals, but use pops of color the most sophisticated way; they stay minimal with clean lines and classic silhouettes, yet step out of the box with novel flourishes that blend in seamlessly. And everything oozes romance-- not necessarily in the amorous way, but more so in the romance of the everyday, like a little bit of beauty interwoven throughout in plain sight. 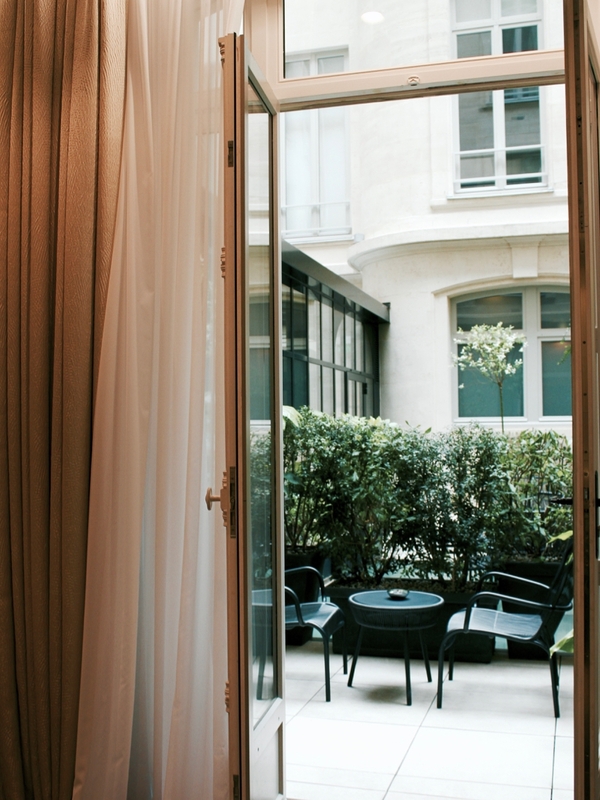 Now taking those notes into account, dream up the most quintessentially Parisian boutique hotel, and Le Narcisse Blanc is exactly that in real life. This boutique hotel is a gem that is nestled right between the Eiffel Tower and Les Invalides, a mere few blocks from the Pont Alexandre III bridge over the Seine. This 5-star hotel exudes luxury without being inaccessible. 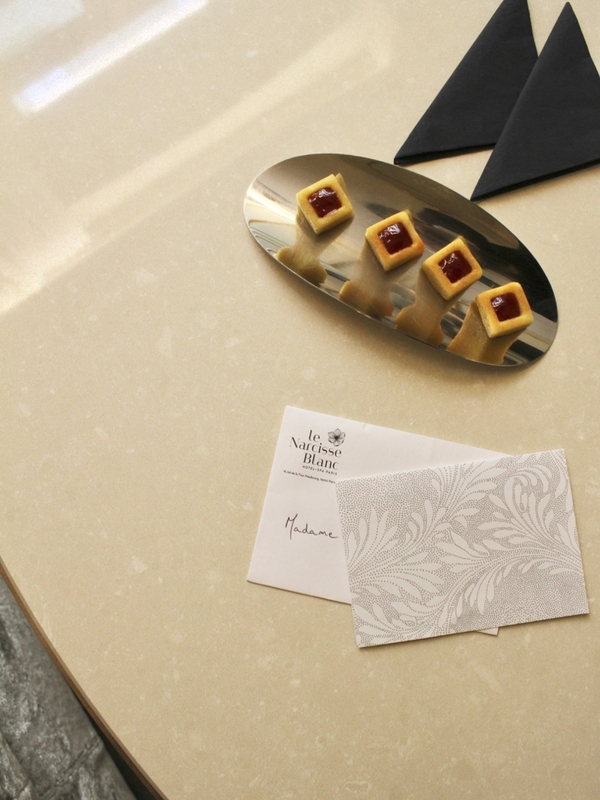 The warm service and hospitality of the entire staff at Le Narcisse Blanc cannot be applauded more, and you're made to feel right at home as soon as you walk in the door. With plush millennial pink loungers, a little library study full of books, and a sun-soaked dining room full of flowers and design accents everywhere, you almost feel like you're in someone's home; someone's gorgeously designed home, that is. I loved the minimalist color palette of black, white, and gold accents, using the pink furnishings and natural greenery to provide warmth and color. This was a hotel I could have easily lounged around in all day if not so eager to explore the sights of Paris. 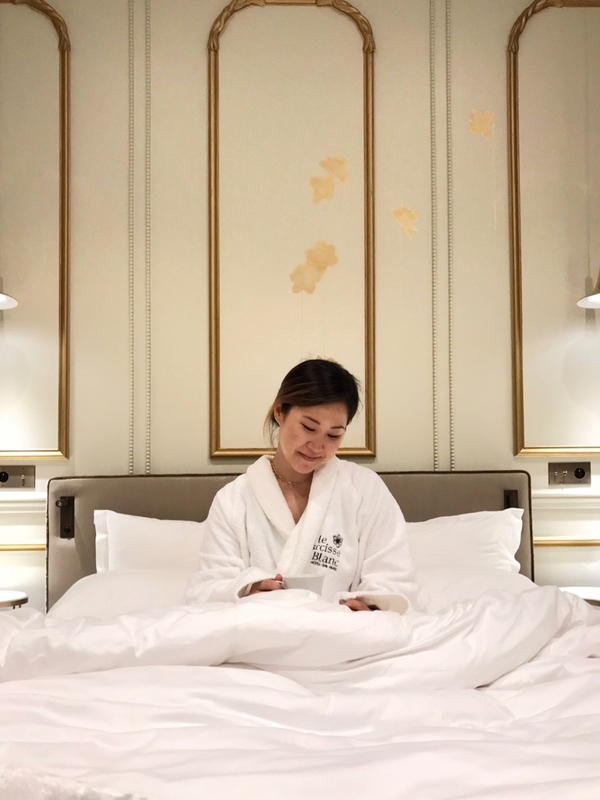 The team at Le Narcisse Blanc were kind enough to surprise me with an upgrade to an executive room, and I honestly felt quite spoilt with how massive and plush this entire room was. Most hotel rooms in Paris are very similar to New York in that they are on the smaller end of sizing, but certainly not this one. The room had a private balcony filled with plants, the bathroom had a waterfall shower, and the bed was so cozy to melt into after a day of walking over 30,000 steps. I was also marveling at the beautiful structure of the room, with the detailed moldings, herringbone floors, and carefully thought out details of outlet placement and lights. That kind of stuff really matters to guests! 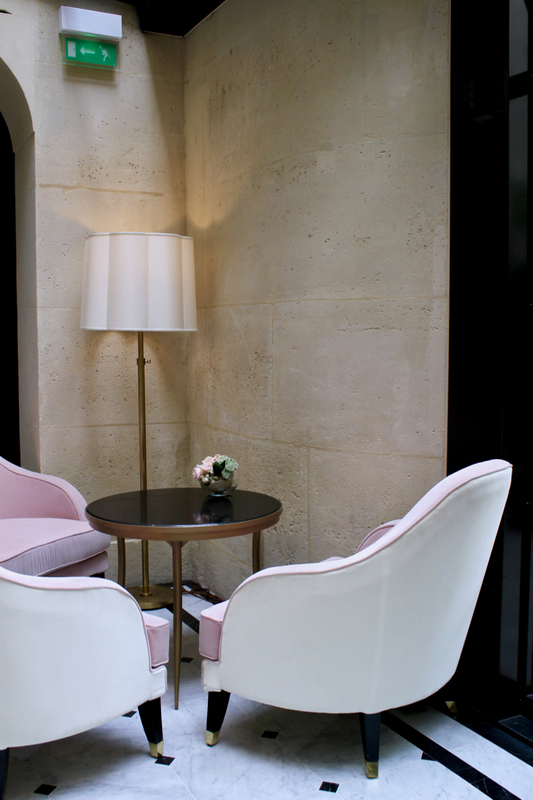 The decor felt a little like a refined King Lous XIV's Versailles meets modern design. 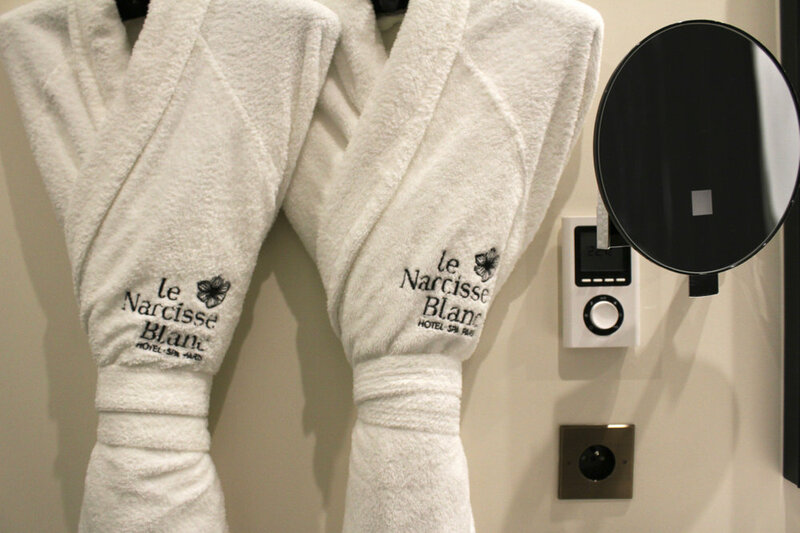 Le Narcisse Blanc is known for their spa, and well deservedly so. 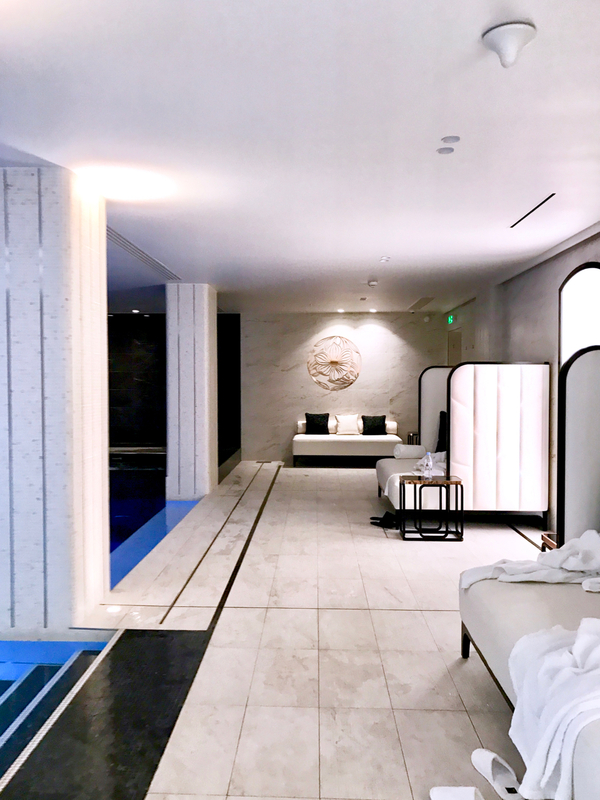 A beautifully serene pool, jacuzzi, steam room, sauna, giant plush seating around the pool, a fitness room, mineral water and healthy snacks, and a full menu of spa services comprise this little cave of wellness and restoration. I had a very hard time tearing myself away from here and spent the majority of my last morning in Paris lounging around here, as it was the most I've pampered myself in a long time. I first got in a quick little 20-minute workout in their chic fitness room, which is very compact but has the bare essentials necessary to get the job done. It felt so nice to jump into their pool afterwards, and relax my muscles in the jacuzzi. After a little sauna, I camped out to read my book in their little private cabana-like couches by the pool in utter serenity. I would seriously come back to Paris, just to spend a blissed-out day here! The restaurant, headed by Chef Zachary Gavillet from Canada, could not have been more conscientious and accommodating of my dietary restrictions. When I had checked-in, I had called the front desk to ask if the little welcome cookies they had kindly set in my room were gluten-free. They must have taken notes, because when I came to the restaurant for breakfast the following morning, the waitress knew I was gluten-free as soon as I mentioned my room number. Now, that is a mark of a top-tier hotel! For the breakfast spread, they had everything from in-house smoked salmon, organic eggs, fruits, cereals, meats & cheeses, yogurts, fresh juices, and of course a big table of freshly baked pastries and bread-- I was very pleasantly surprised to see gluten-free bread available too, and I was happily able to enjoy some bread and jam on my last morning in Paris, post- spa morning. Did I mention yet how this entire stay was basically my ultimate Parisian dream? Yes, it was. A very special thanks to Le Narcisse Blanc for kindly welcoming Living Minnaly. All opinions and reviews are solely mine; as always, thank you to my readers for continuing to support the brands that keep Living Minnaly up and running!